Costa Rica is a very slow paced laid back and beautiful country. The people are very welcoming to visitors in this peaceful democratic nation. The natural beauty of the country is breathtaking. All of this makes Costa Rica a wonderful destination for travelers from all over the world. Active travelers can surf, hike, snorkel and watch wildlife. The differences in the topography means you can relax on a hot sandy beach or visit an active volcano. Thrill seekers can feed their need for adrenaline fueled adventure by zipping through canopy lines hundreds of meters long or ride the surf of the Pacific ocean. Even Though Costa Rica has become a very popular travel destination for people all over the world and the large resorts have moved in staking their claim to the tourism boom of recent years, ecologists and proud locals have been very active in keeping most of the country in its natural beauty. 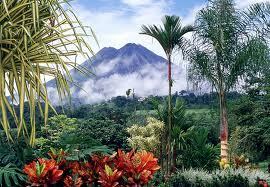 Arenal is a must see for first time visitors. By day you may hear it rumbling and quaking and see the almost perfect conical shape. But at night this volcano will put on a light show you won’t forget. There are almost constant eruptions of red hot lava pouring flaming rock, displaying its true power and beauty. Manuel Antonio, one of the country’s most famous national parks is the Costa Rica you’ve imagined. You can watch all sorts of monkeys going about their normal routine, while you take a relaxing hike along the tree lined shore. One of Costa Rica’s most beautiful wildlife adventure is Tortuguero, an intricate network of narrow canals that wind their way through the lush jungle and coastal wetlands. You can canoe through these waterways looking for the untouched wildlife of the jungles. If you are looking for a thrill, you can head to the tiny town of Turrialba in the Central Valley for some of the most intense whitewater rafting of the Central America. If you want a day filled with some serious heart pumping adventure then this is the trip for you. After your thrill seeking adventure you can relax on one of the most picturesque beaches in the world. Samara is a beautiful strip of powder white sand that lies between the gently rolling turquoise seas. Costa Rica offers something for every Traveloper, and you can find some excellent money saving vacation packages to Costa Rica by searching travelope.com, where no destination is out of your budget.